It’s official. The good old days are gone. (T)he party is nearly over. We now have the capacity to discover extrasolar planets, and new ones are found every year. Fortunately for latecomers to the planet builders guild, megaplanets are easier to find that Earth sized ones, and NASA keeps cutting funding. Still, it won’t be too many years before you can’t decide for yourself where, within the limits of orbital mechanics, you want the planets of Alpha Centauri or Procyon to be. Science has a way of getting somewhere a lot faster than you would expect. Manned space exploration doesn’t fit that statement, because it runs on politics, not science. On February 22, in Nature, it was announced that seven Earth size planets had been discovered circling a single star only thirty-nine light years from Earth. Far more important, all seven orbit within the band of temperature where liquid water is a possibility. By contrast, our system has one such planet, Earth, and maybe Mars for a few minutes on a hot afternoon near the equator in mid-summer – if the ice doesn’t sublimate instead. Seven; its unheard of. The star is TRAPPIST-1, an M dwarf. In fact there has been a mini-revolution in the search for exoplanets. NASA’s Kepler space telescope has found more that 4700 potential planets. Many of these will no doubt turn out to be false positives, since the techniques of the search are not perfected, but it is still a staggering number. Most of these were found around stars similar to our sun – where else would you look first? Very few of them are both Earth sized and at the right distance from their star to have the possibility of liquid water. Since a mechanical failure in 2013 compromised its ability to orient itself, Kepler has concentrated on observing red dwarfs. To eveyone’s surprise, the planet candidates found around these small, dim stars tend to be more Earth sized. And there are a lot of them. The TRAPPIST-1 discovery, however, was not by NASA but by the TRAnsiting Planets and Planetesimals Small Telescope group operating out of the University of Liège, Belgium. That explains the use of caps; TRAPPIST is an acronym. If you want details – and of course you do – the best source is here. This page from the University of Liège is in French, but the video which will self-start is in English, and gives enough details to stir the blood of any space or science fiction fan. It took me about three seconds to start speculating about what kinds of novels could be written about the exploration of the TRAPPIST-1 system. Suppose most or all of the seven planets had some form of life, all evolving independently. Suppose we write about a paleontological mission on a planet which had vertebral life, then lost it; these dwarfs have a solar wind that operates heavily on planets so close in. Suppose at some time in the deep past, a spacefaring civilization arose on one of these planets, colonized the others, and then died out. Or didn’t die. Or seems to have died until our intrepid explorers begin to poke around. Okay, I was wrong. The golden age is still here. This entry was posted in A Writing Life, Uncategorized and tagged astronomy, science fiction, space travel, writing on March 15, 2017 by sydlogsdon. Everything in a writer’s life is grist for the mill. For a science fiction writer that includes science itself and, in my case, the teaching of science. Here is some more teacher geek. In a book on teaching middle school astronomy, this would be an appendix. When I was in my early teens and discovered the local library, it not only gave me science fiction, but science as well. I remember the dozen or so books on popular astronomy. I particularly remember How to Build a Telescope, which aroused my lust then dumped me when I found out I didn’t have enough money to but the mirror blanks. I grew up figuring out that kind of analogy, but if I gave such a book to one of my modern students, their eyes would glaze over and the wheels would stop turning. The children of Sesame Street have to be shown. Would you like a simple example? Did you know that a softball is moon-size in comparison to a 12 inch classroom globe of the Earth? And if you hold the softball 30 feet away from the globe, it will be proportional in distance as well as size. For the rest of the solar system, you can’t show both proportional size and proportional distance in a classroom. You can buy a poster with the proportional sizes, but the planets are all on top of each other. 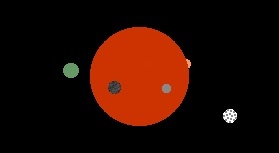 If you make a chart of proportional distances, the individual planets will be too small to see. You can do both, however, if you are willing to take the exercise outside. We are about to make a model of the solar system. If you want to get out your calculator, be my guest, but I’ve already done the math and I’m willing to share. The scale I used was one to one billion. It would be easier in metrics, but we will eventually be using a local road map for this, so the good ole American system will have to do. The chart below is in miles and double-steps. That’s because we want your students to get into the act and count the distance to the planets. A double step is normal walking, counting every time your left foot hits the ground, one-and-two-and-three-and . . .
You can skip Pluto if you want, but when I first started doing this, it was still a planet. Give some of your students models of the planets (we’ll talk about sizes below) and take off with the whole class, counting double steps. At 38, leave the student with the Mercury model and continue with the rest of the class. Et cetera. None of this would be worthwhile without models to show how small our planets are in comparison to the space they inhabit. I made Mercury, Venus, Earth, Mars, and Pluto out of beads or glass headed pins, stuck into dowels. Be sure to paint the dowels orange for when Johnny loses one in the long grass. The rest of the planets were made of rubber balls found after multiple trips to toy stores, and painted with artists’ acrylics. You need these sizes, and this time I’m going metric because it’s way easier. Feel free to pass this on to anyone who might want to make this model. This entry was posted in A Writing Life and tagged astronomy, memoir, science fiction, space travel, teaching, writing on August 17, 2016 by sydlogsdon. This is a follow on to Monday’s post. If you haven’t read it, you might want to give it a glance. I’m going to show you how to construct a simple instrument to measure sun angles. It works especially well at the solstice, but a few days late won’t hurt if you are only out to amuse yourself and maybe learn something. I first used this when I was considering where to place windows in a building to get north light without afternoon glare. You could use it to pick out the optimum placement for solar panels, or decide how deep to make a south-facing porch. FYI to my followers in Brazil, New Zealand, and Australia. I am going to write as if everybody lived in the north latitudes; I’m sure you are used to modifying that kind of writing to meet your own needs. Sorry, but it’s just too clumsy to qualify every statement. All you need to measure sun angles is a board with a vertical dowel or wire set into it near the center. You could use a carpenter’s square for that. You will need a spirit level to level the board, and it wouldn’t hurt to then use the level to see if the dowel is still vertical (what carpenters call plumb). You will mark the shadows as they fall directly on the board. This is what I used the second year. The first year i drove a rusty used pipe into the ground and drove stakes into the shadows. Same principle, but far too clumsy. Next, you need your local sun time. Subtract daylight savings time, but that isn’t enough. Noon, by the sun, is when the sun is directly south of you. Clearly that is an hour earlier on the east side of your time zone than it it on the west side, so you need your longitude and some simple arithmetic. There are twenty four time zones, each 15 degrees wide. The first time zone is at zero longitude in Greenwich, England but, again, it’s not that simple. Time zones center on their base longitude. The first zone lies from seven and a half degrees east longitude to seven and a half degrees west longitude, and the other zones follow suit. Then all is adjusted to match up with political boundaries, but we can ignore that. Let’s choose Oklahoma City as a neutral site, so I can give a shout out to their wonderful Fleming Fellowship, celebrating its sixtieth anniversary this month. OKC is at 97.5 west longitude. If you ignore political gerrymandering, OKC’s time zone centers on 90 degrees longitude, so OKC is on the western boundary of the theoretical time zone; the political time zone ends on the western border of the state. The sun is south of OKC when your watch says 1:30 PM, if your watch is accurate and you have it set for daylight savings time. 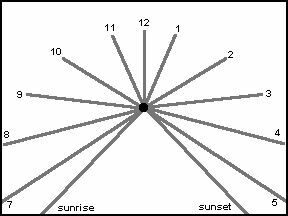 To find solar noon for the longitude where you live, add or subtract 3 minutes for every degree you are west or east of the theoretical center of you time zone. I like to set my board up the day before and rotate it so that the (solar) noon shadow lies parallel to this sides of the board. That isn’t necessary, but it makes for a neater project. Then I’m ready to record the shadow that falls at sunrise. Sunrise is problematical. You can look it up for your area, but it’s not that simple. (Have I said that before?) If you live on a mountaintop, sunrise will come earlier. If you live in a valley – or, in my case, on the west side of the Sierras – it will come later. How much can’t be calculated. It depends on how far west of that hill you are, and how high that hill is, and whether today’s sunrise happens to fall behind your neighbor’s house, or behind that big oak tree. It will come when it will come. Have a straight edge handy and draw a line from the dowel down the center of its shadow, then write down the time. Continue through the day. I try to make a mark every hour on the (solar) hour. Early and late shadows will probably run off the board, but for the rest you can calculate the sun’s vertical angle because you will know the height of the dowel and the length of the shadow. Personally, I take the measurements, redraw the triangle on another piece of paper, and measure with a protractor; but then, I grew up before calculators. You do realize that this is the year’s extreme for north tending sunrise and sunset and for high sun angles, and that every other day until December will be slightly different. Even if you never design windows for north light without afternoon glare, or plan the placement of solar panels, or decide how deep to make a new porch, taking the sun’s angles throughout the day will give you a better feel for your personal environment, and a new appreciation for the complexities of astronomical observations. Extreme astronomy geeks will repeat the process at the equinox and winter solstice, but good luck if you try. I’ve never been able to pull off any shadow measurements in December because of clouds. This entry was posted in A Writing Life and tagged astronomy, memoir, seasons, teaching, writing on June 22, 2016 by sydlogsdon. We learn our astronomy from books, but that isn’t how the science started. The ancient Greeks learned about the stars by looking at the stars. Their understanding was a mixture of observation and myth, with myth sometimes predominating. When we are young, we also learn astronomy from casual statements we hear from adults. I’ll give you an example. Mars has recently been at a close approach; every evening lately, when I step out my front door (miles from the nearest city) to look at the sky before bed, there it is, red and bright, about halfway to zenith in the south-eastern sky. Now imagine that I say to a child, “Mars is really getting close.” Just that, with no other comment. What images might pop into that child’s mind? Now we are more accurate but we’ve confused 90% of the students. It should be obvious by now that this is a bit of a how-to based on long experience. Even if you aren’t a teacher, you will probably someday have to explain this kind of thing to your own kids. Let me suggest a third option. First explain things in your best lecture voice with reference to the textbook and with drawings on the board. Then pick a student sitting in the middle of the classroom; out of kindness, choose someone who likes attention. Say, “Helen, don’t move. For the next few minutes, your head is going to be the sun.” Then establish where Polaris lies, for the sake of the demonstration. Your classroom may not allow you to use real north. If some bright, smart-mouth kid catches you out, don’t get mad. Rejoice that someone is paying that much attention and make it a teachable moment. Now walk around the classroom with the classroom globe tilted toward your Polaris and talk them through the seasons, pointing out that the tilt never changes in relationship to Polaris, but it appears to change in relationship to Helen, our sun. Pat your worst troublemaker on the shoulder as you pass him, wink at the shy girl in the back corner who never volunteers, and say, “Excuse me, Earth coming through,” when you have to dodge around desks. There is a rule of thumb for teaching science (which probably doesn’t work for algebra). If you enjoy teaching, and you let your students enjoy learning, they probably will. That exercise was for letting students visualize things they can’t see for themselves. You can also help them see things that happen in their everyday world, but normally go unnoticed. Observing the path of the sun through the seasons is an Earth’s-eye-view version of the tilted globe carried through the classroom. How do you compress a year’s worth of observation into one 40 minute session, using the real sun instead of charts and graphs? It can be done, but it takes nine observations on your part, spread over three days, with those three days spread over half a year. It also takes a small can of paint and a paintbrush. When I set this up, I picked a solid, upright, eight foot steel pole which was set up away from the shadows of structures and which I knew would not be disturbed for years to come — a volleyball net pole out on the playground. At 10 AM, noon, and 2 PM (sun time, not daylight savings time) one summer solstice I painted three inch circles (same diameter as the pole) at the pole shadow’s tip. I repeated those actions during the fall equinox, which was intriguing for my students. I had a paint can and small brush at the ready during my ten and two classes, and on the stroke of the hour, I ran out of the classroom, painted the circle, and ran back in while they watched from the windows. The noon painting had an even bigger audience because of noon recess. As you might guess, I told those who asked questions, “You’ll find out what this is all about — some day.” On Christmas break I painted the last three circles during the winter solstice. 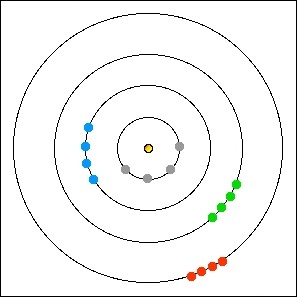 That spring, and for years afterward, I arranged to teach solar motion as near as possible to the spring equinox. The solstices fall outside school days, and the fall equinox is often cloudy in California. I explained everything with lectures, and reading, and drawings on the board, but then we all went out to those nine circles on the playground. As I talked them through the lesson, we all watched the pole’s shadow move. It is fascinating in our mile-a-minute world to take the time to watch a shadow inch its way across the ground. Even if it wasn’t 10 or noon or 2, everyone could see that the shadow’s tip either had or would touch all three of the middle circles. I explained how I had placed the circles and invited students to lie down with their head on a circle and look past the tip of the pole to see where the sun would be (or would have been) at noon or 10 or 2 on the first day of summer or the first day of winter. They paid attention. On days they pay attention, learning happens. It isn’t easy, but it works. This entry was posted in A Writing Life and tagged astronomy, memoir, seasons, teaching, writing on June 21, 2016 by sydlogsdon.